The Fourth Gospel has been a rich resource for the Christian church in the development of its trinitarian doctrine of God. Surprisingly, however, few extended studies of its trinitarian theology are available. In this new contribution to the New Studies in Biblical Theology, Andreas J. Kostenberger and Scott R. Swain provide a thorough biblical survey and theological treatment of the three persons of the Godhead in John's Gospel--situating it within the context of Second Temple Jewish monotheism; synthesizing the Gospel's treatments of each Person of the Trinity; exploring the connections between its account of Jesus Christ, the Holy Spirit and mission; and considering the significance of John's Gospel for the church's doctrine and practice. About "Father, Son and Spirit (New Studies In Biblical Theology Series)"
"While there have been recent, fine studies on aspects of John's doctrine of God, it is surprising that none summarizes and synthesizes what John has to say about God as Father, Son, and Holy Spirit. 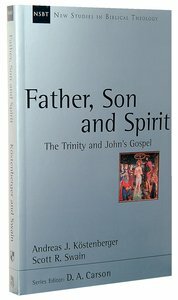 In order to fill this gap, Kostenberger and Swain offer a fresh examination of John's trinitarian vision." "Part One situates John's trinitarian teaching within the context of Second Temple Jewish monotheism. Part Two examines the Gospel narrative in order to trace the characterization of God as Father, Son and Spirit, followed by a brief synthesis. Part Three deals more fully with major trinitarian themes in the Fourth Gospel, including its account of Jesus Christ, the Holy Spirit, and mission. A final chapter discusses the significance of John's Gospel for the church's doctrine of the Trinity, and a brief conclusion summarizes some practical implications." "For those who want to know what they ought to believe ... out of God's self-disclosure in Scripture, this book will be a stimulating delight' (D. A. Carson)." --BOOK JACKET. Andreas J. Kostenberger (Drs., Vienna University of Economics, Ph.D., Trinity Evangelical Divinity School) is Professor of New Testament/Director of Ph.D. Studies at South East Baptist Theological Seminary, Wake Forest. He is also the editor of the Journal of the Evangelical Theological Society, and the author of numerous books including The Gospel of John (Baker Exegetical Commentary of the New Testament) Encountering the Gospel of John, The Book Study Concordance of the Greek New Testament, and The Missions of Jesus and the Disciples according to the Fourth Gospel. He also translated Adolf Schlatter's two-volume New Testament Theology. His current publications include The Pastoral Epistles (Revised Expositor's Bible Commentary); A Theology of John's Gospel and Letters: The Word, the Christ, the Son of Godand The Cradle, The Cross and The Crown. Dr. Scott R. Swain (PhD.,Trinity Evangelical Divinity School) is Assistant Professor of Systematic Theology, Reformed Theological Seminary, FL. Before joining the RTS faculty, Scott taught at Trinity Evangelical Divinity School in Deerfield, IL and Southwestern Baptist Theological Seminary in Fort Worth, TX. Scott seeks to fuel a passion for evangelical theology ? theology done according to the gospel ? in the classroom and the church. He is the author of God according to the Gospel: Biblical Narrative and the Identity of God in the Theology of Robert W. Jenson, Father, Son, and Spirit: The Trinity and Johns Gospel (co-author with Andreas Kostenberger), and Invitation to Biblical Interpretation (co-author with Andreas Kostenberger and Richard Patterson). -Editorial Review. By almost any measure, a bold and confident use of the Bible is a hallmark of Christianity. Underlying such use are a number of assumptions about the origin, nature and form of the biblical literature, concerning its authority, diversity and message. However, a lack of confidence in the clarity or perspicuity of Scripture is apparent in Western Christianity. Despite recent, sophisticated analyses, the doctrine is ignored or derided by many. While there is a contemporary feel to these responses, the debate itself is not new. In this excellent study, Mark Thompson surveys past and present objections to the clarity of Scripture; expounds the living God as the Guarantor of his accessible, written Word; engages with the hermeneutical challenges; and restates the doctrine for today. 196 pages, from IVP. Pastor and scholar Jonathan Griffiths considers what the Bible has to say about preaching in the post-apostolic age, beginning with a theology of the word of God, and proceeding to survey Greek preaching terminology, and the scope and character of New Testament word ministries. The length and complexity of the book of Isaiah make it a real challenge to grasp comprehensively. Andrew Abernethy helps readers by using the concept of 'kingdom' as a framework for exploring the book's key themes: God, the King; the lead agents of the King; the realm, and the people of the King.